What’s your idea of relaxation? Sitting in an outdoor hot tub, listening to the birds and the bubbles while gazing out into a dense pine forest? Or lying down in a Scandinavian snug, wrapped in a fleece blanket next to flickering candles and a crackling fire? Being a regular visitor to Center Parcs Sherwood Forest, I already knew that the resort has everything you could possibly need for an adventurous family holiday. However, thanks to its newly revamped £3million Aqua Sana spa, it is also a must-visit destination for couples and adult groups. During a short break here, you could easily imagine yourself at a sleek standalone European spa rather than a family-focused destination. It’s ideal for Valentine’s Day, anniversaries, birthday treats, mums-to-be, dads-to-be, knackered parents and new lovebirds. Basically, anyone who is in desperate need of a bit of ‘me’ time. Having left our two daughters with their grandparents, my wife Rachel and I whizz down the A57 and rolled into Center Parcs on a Saturday morning, excited at the prospect of some pampering and relaxation. After checking in at the reception, we begin the morning with a hot drink, pastry and glass of bubbly before getting into our swimsuits and fluffy white robes and heading into the spa. Aqua Sana first opened in Sherwood Forest back in 1987 and its previous ‘World of Spa’ concept was inspired by spas in Turkey and Japan. 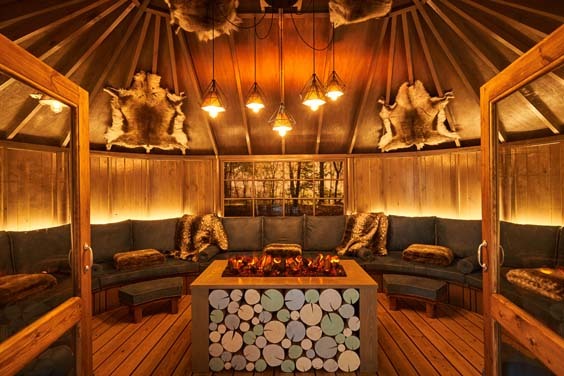 But after a massive revamp this year, it now features 26 different experiences, making the most of its natural woodland surroundings and taking inspiration from the icy Nordic landscapes and the high-altitude Chilean Arenal forests. As before, the spa is on two levels. Roughly speaking, the saunas, steam rooms and pools are on the Forest Floor, while there are various relaxation areas upstairs in the Forest Canopy area. With six ‘zones’ to choose from, each containing rooms that target a different sense or body part, we didn’t know which to head to first. Our favourite areas on the ground floor were the Nordic Forest which, taking its cue from Scandinavia, features a Northern Lights-inspired display combined with purifying Alpine steam, an intense Nordic sauna adjacent to the invigorating Ice Cave, and the glorious outdoor Scandinavian Snug, complete with flickering fire pits. 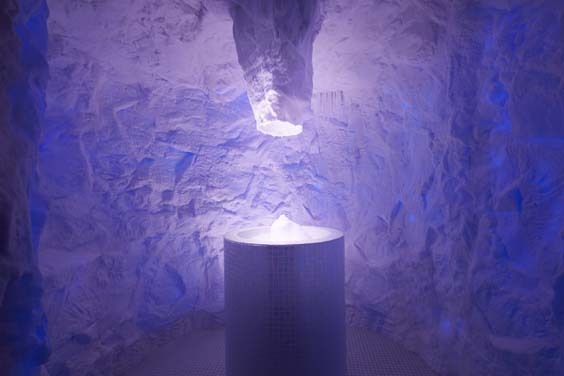 Then, in the Volcanic Forest, the steam room is designed to ease tension and detoxify skin, while the hot, dry lava sauna relaxes the muscles. Upstairs, the Treetop Nesting zone contains waterbeds and heated body-contoured loungers, but the new sparkling jewel in Aqua Sana’s crown is undoubtedly the Treetop Sauna. We take the stairs 10m high into the forest canopy and soak up the awe-inspiring panoramic views of Sherwood Forest while the dry, therapeutic heat works its magic. Finally, Aqua Sana’s old favourite, the Outdoor Pool, also has a makeover, and whether the sun is shining, the stars are twinkling or the rain is falling gently, it’s still a tranquil and refreshing experience. All that rest and relaxation can quickly become hungry and thirsty work, so for lunch we head to the Vitalé Café Bar which serves up a range of Mediterranean salads, tapas, flatbreads and ciabattas. Then it is time for our treatments. I opt for the Freestyle Deep Tissue Massage which the masseuse Melissa tailors entirely to my needs. The combination of rigorous pressure and relaxing aromatic oils is just right and eases my muscle pain as well as providing stress relief. Meanwhile, Rachel’s Swedish Massage with Lydia is less rigorous and designed to increase the oxygen flow in the blood and release toxins from her muscles. The development of Aqua Sana forms part of a wider £15m investment programme at Center Parcs Sherwood Forest over the past 12 months. There are several new lodges springing up around the Nottinghamshire park, and after our afternoon at the spa, we check into one of the park’s newer studio-style Executive Apartments, complete with well-equipped kitchen, living and dining area, and upstairs bedroom and bathroom. After a day of adequate detox, we have built up quite an appetite, and in the evening we book into Center Parcs’ Indian restaurant Rajinda Pradesh. Washed down with a glass of wine and an ice-cold pint of Cobra lager, we munch on poppadums and pickles, lamb tikka masala, chicken rogan josh, naans and pilau rice, before heading over to the Forrester’s Country Club for a cocktail nightcap. Although the spa is the main attraction for us this particular weekend, you can’t really visit Center Parcs without getting the urge to be out and about. And the next morning, after breakfast at Vitalé, we still had time for a walk around the site before departing and picking the kids up from their grandparents’. As busy working parents, the stresses of life occasionally take their toll and it feels like we can’t see the wood for the trees. But at the Aqua Sana, we were both rather pleased that the forest was all we could see. Aqua Sana offers spa sessions for Center Parcs guests (from £38pp), spa days (from £85pp) and spa breaks (from £185pp) so you can escape to the spa in the forest for as long as you like.